But did Triumph really want its new bike appearing just yet? WHILE Triumph must be over the moon to have a name like David Beckham attached to its bikes, it seems a little odd that its still-secret water-cooled Bonneville has turned up in promotional pictures for the footballer’s first starring role in a movie. 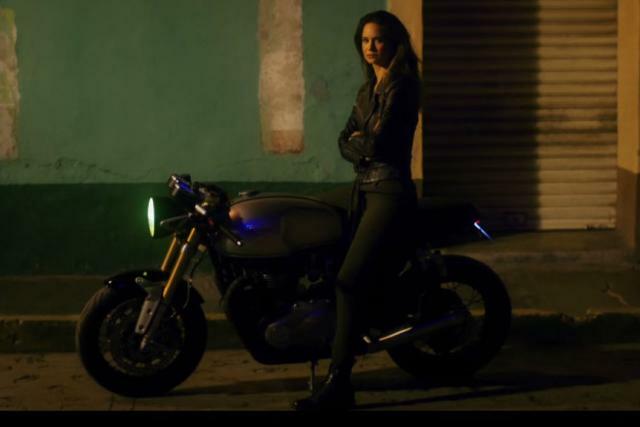 Promoting the forthcoming short film ‘Outlaws’ – a surreal creation made using money from clothing firm Belstaff and featuring Becks as a motorcycle stuntman and drifter alongside established stars like Harvey Keitel – stills released by Belstaff clearly show the unreleased Bonneville in its highest-spec form. The new bike’s radiator, marking it out as water-cooled, is clearly visible, as are the totally new engine cases, tank and frame. 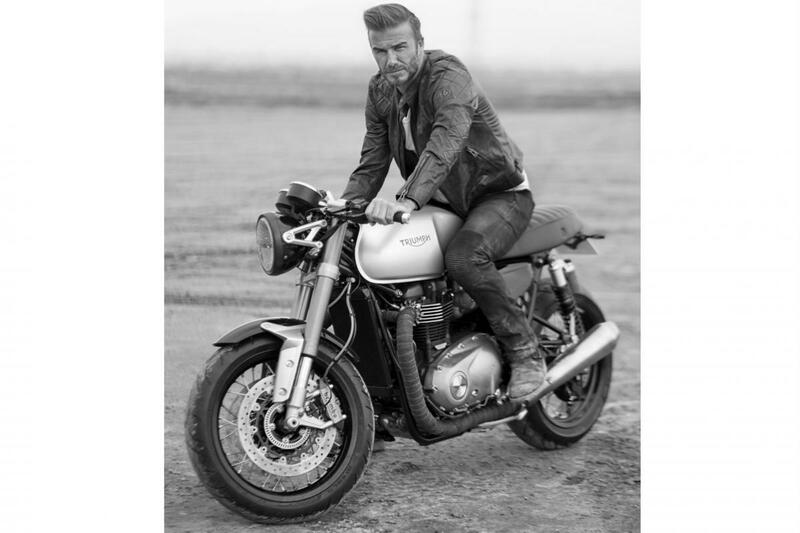 The bike seen with Beckham above isn’t replacing any specific existing model but will instead sit above the Thruxton as the sportiest version of the Bonneville. Eschewing the fully-retro style of previous Bonnevilles, it adopts modern Öhlins suspension at both ends and Brembo radial brakes. There’s speculation that it could be called the Street Tracker – reflecting a trademark filed by Triumph – or perhaps the Speed Twin. The engine is believed to be larger than the current Bonneville’s, although every prototype spotted so far – including three spied in Spain yesterday – has been registered as having the same 865cc capacity as the existing Bonnie. It will certainly be more powerful and cleaner thanks to its water-cooled design. While we’ve seen spy shots of this bike several times, this is the first one to be officially photographed, complete with a Triumph logo on the tank. It’s not completely standard – the seat doesn’t match the bikes that have been spied, it’s missing its mirrors and has trendy exhaust wrap – but it’s otherwise much as we expect the final bike to appear. You can see a trailer for the movie here. Beckham actually appears to ride a Scrambler in it, although the new bike does appear at the 24 second mark, as shown in our screen-grab. Will Yamaha’s 1000cc triple prompt Triumph to finish four-wheeler project?